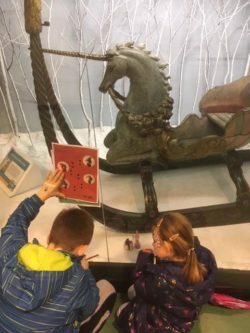 Blog » We’ve been to the Hull Museums Christmas Activities! 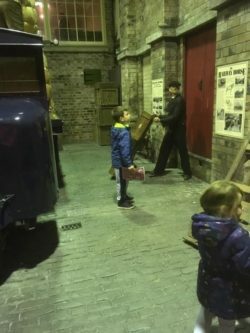 We’ve been to the Hull Museums Christmas Activities! This year Hull Museums are doing Christmas a little differently. For the past few years they have held one big event, their Victorian Christmas, something we’ve been to and really enjoyed. They got in touch with me to let me know that this year there will be FOUR events! 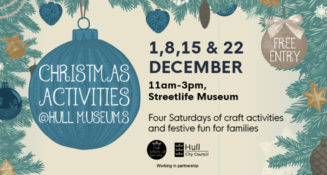 The events are running on the first four Saturdays in December, all are taking place inside Streetlife Museum 11am-3pm and all are FREE. 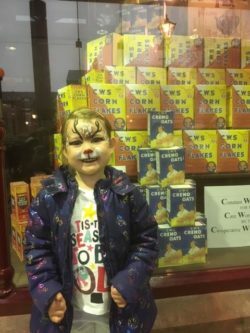 At all four events there will be festive trails to complete around the museum, seasonal crafts and face painting, plus festive music and a Christmas story, all free of charge. Saturday 8th December: Make your own Christmas cracker and put it on the tree for all to see! Saturday 15th December: Design your own gift boxes, wrapping paper and gift tags. Saturday 22nd December: Create your own Art Deco stained glass Christmas cards and tree decorations. I took my kids along to the first event on Saturday 1st December and it was a great way to get us in the festive spirit. We arrived to the sound of a brass band playing carols and collected our trail sheets. There is one trail to complete downstairs where you need to look around the exhibition for clues and another trail upstairs where you need to find the elves hidden in the displays. We go to Streetlife quite often but the trail sheets helped my kids to look properly at the different areas, we spotted things we hadn’t seen before and they were really good fun. We stopped off for a lovely Christmas story between the two trails. We then went to the old street scene area for the free crafts and face painting. The face painting was excellent; the lady doing it was very talented and the face paint easily washed off with water later that evening. My daughter had a beautiful reindeer on her face and my son had a funky snowman with a Hull City scarf on his hand. The crafts at our session were to make an angel, snowflake and a snow globe. The materials were really good quality, there were plenty of helpers on hand to direct my kids and both my children really enjoyed the activities. We also now have some lovely festive crafts hanging around our house! I really like the idea that there are four opportunities to go along and experience the Christmas Activities at Streetlife this year, you can go to one or all four! All events are completely free, you don’t need to book just turn up and join in. They’re a great, free way to entertain the kids on the run up to Christmas and I’d highly recommend going along. For more information visit their website here or follow them on facebook here.